I was working in the backyard yesterday about suppertime when I heard a screech of some sort. It did not register at first but then I figured out it was some sort of an animal in distress. The sound came from behind the mini-barn where there is a large blackberry garden. I decided to investigate and see just what it was that was making all that noise. I walked slow as can be back towards one side of the mini-barn with an eye towards a quick escape in the case that whatever had made this yet unkown animal upset would have a similar affect on me. I got about ten feet or so from the back of the barn when I saw what had occured. Right there in front of God and everybody was the largest hawk I had ever seen. He was in amongst the blackberries with his wings spread out all the way (I figured his wing span to be somewhere between two and three feet, possibly more). He was shuffling around and carrying on quite a bit. When he pulled his wings in, I saw what he had done to raise such a ruckus. Gripped in the hawk’s talons, and struggling like all get out, was a good sized rabbit. The poor thing was fighting for all he was worth and that big ole hawk wasn’t about to let his dinner get away from him. I sat down on a brick ledge about ten feet away and watched this fight for life. By and by the rabbit gave up the ghost. That hawk drug him a little bit away from the blackberry bush for reasons he did not state. Once he got his dinner situated the way he wanted it, he commenced to eat. I got my camera and moved, quiet as a church mouse, as close as I thought I could get away with. 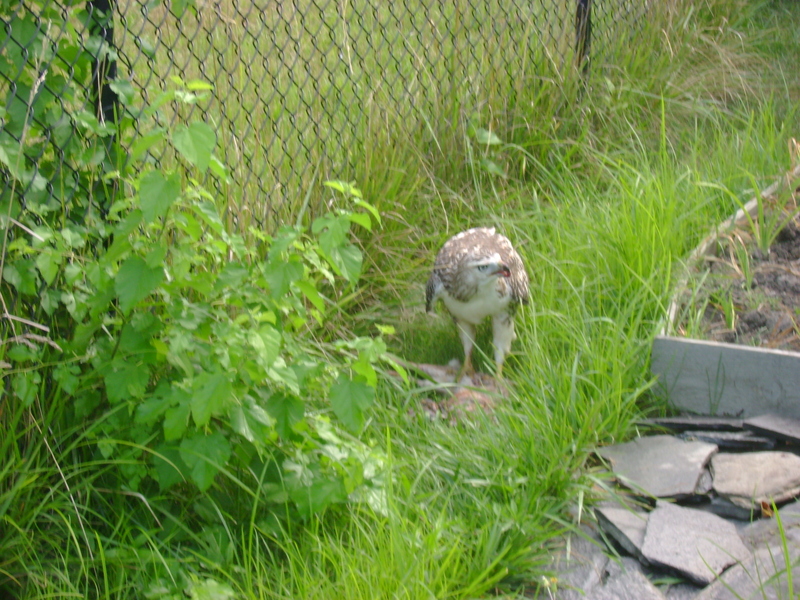 (There is a photo here of said hawk and his dinner). It took him near on to an hour to finish eating and I sat, not but a few feet away, and watched him eat. This was the second time that I have had the opportunity to watch a wild animal kill and eat (the other time was a timber rattlesnake who dined on a squirrel). Now, the thing about snakes is they eat everything. There is never a thing left behind. Hawks are different. I guess he took his fill of the rabbit and left the rest. Is there anything meaner than a snake? I have used the term “meaner than a snake” on several occasions in description of those people who exhibit a well developed streak of meanness that occurs not often among humans. Those folks who have the ability to “out mean” a snake are not as rare as one might think. It is fortunate for us that these people do not have possession of anything resembling venom otherwise there may be additional dangers lurking for us beyond their ability to inject verbal poison into all of society. Being an inquisitive type, I am bound to ask the question, is there anything meaner than a snake? Before I can ask that question, let’s examine the issue from the snake’s point of view. First, the snake is generally considered the instrument by which Eve was enticed to eat the apple in the Garden of Eden and so screw up everything for the rest of us. I am confident that the snake’s part in the matter has given him a bad reputation from the very beginning. The universal quilt imparted on every snake that ever lived is, I am sure, a lot of the reason why one never ever sees a snake in a good mood. It’s true. There is no known record of a snake ever smiling or being anything other than just flat out ornery. In fact, a lot of them have developed particular talents of meanness in order to torment humans and other living things. Some of them can inject poison that can kill any living thing it manages to bite while others can squash a fellow so that he can’t breathe anymore. The ones that can’t do either are able to frown and look meaner than they really are. Second, when that one snake got the best of Adam and Eve, the Almighty decided that all snakes would have to crawl around on their collective bellies all their lives. I am certain beyond doubt that that was sufficient reason to make anybody sour. As if that weren’t enough, The Almighty further decided that snakes and folks would never get along. It is a safe wager to say that there has never being anything resembling friendship between a man and a snake ever since. Finally, given his inglorious beginnings and his eternal punishment, it is no wonder that Mr. Snake is meaner than anything else on earth. I still wonder whether there is anything that could actually be meaner than a snake. I decided to pose the question to the internet in hopes of finding an answer. I did see a website that had an apron for sale with the words “meaner than a striped snaked” emblazoned on the front. Could it be that there is a cook somewhere worthy of this dangerous honor? I hope I never meet anybody wearing such an apron. There was also a comment on the web that purported to declare that tequila, taken in quantity, can make one meaner than a striped snake. That is an idea whose validity I do not intend to explore. I think it is safe to say that there is nothing on this earth meaner than a snake. Well…there is one possibility but fear for my life prevents disclosure. I took that piece of bait and now I’m stuck with it. I thought about this “motto” for quite awhile and even confess to a loss of sleep over the matter. There are differences between the two, as I have discovered. One who is dumb is the person who is lacking in natural intelligence while the stupid of the world are those given to unintelligent decisions or acts. Mind you, the two words have several different meanings. Dumb has six different meanings and stupid has four. The latter trait occurs much more often in the world and no one knows why. I have not done an in-depth study of the occurrence of these traits among us so cannot of certainty say one way or the other. It does sound like something that would qualify for a government study grant though. So, having defined dumb and stupid, it is left to me to decide whether I can tolerate one trait over another. It seems to me that one who is dumb is so from birth. He or she just lacks any smarts whatsoever and, therefore, cannot be faulted for their disadvantage. It is possible that a normal child could be rendered dumb by environment but that is a rarity. Dumb is just plain dumb and they should never be faulted for their natural lack of intelligence. Most folks found to be in this category have walking around sense and can usually find something to do with themselves that keeps them out of trouble. People learn to be stupid. They have sense but have made a choice not to use it. These are the folks that usually wind up in positions and jobs that makes one wonder about the future of the human race. I know far more stupid people than dumb and they are the more difficult of the two. Stupid people make stupid decisions that affect all of us. I know of one group of people who are notorious for attracting, developing, and employing stupid people (much to the anguish of a whole lot of people). They are a well-known bunch of cerebral misfits but, being as how I have a policy prohibiting putting the “bad mouth” on any living creature, I will refrain from naming them. They are just one example of many. There is a cure for stupid but it is rarely employed. My friend’s assertion is correct. I can take dumb but I can’t take stupid. I am reminded of a time back on Hall Street in Amarillo. I don’t recall just what it was that got me going on it, but for some odd reason, I determined that I was going to dig a hole in my back yard that would allow me to go to China. God only knows why I would want to leave the great state of Texas for China, but I did. It is not the unsuccessful subterranean attempt to reach China that is the story here. The aftermath is much more colorful. After careful study which consisted of locating a spot that seemed about right to me, I started digging. I dug wholeheartedly for about two or three feet until something dawned on me that halted the project cold in its tracks. Two items of great import occurred to me. First, I did not speak Chinese so when I did get there, nobody would understand me and I would probably be arrested. Second, I did not know anybody there. Those two considerations led me to decide that maybe I would just travel there when I got to be an adult. Besides, Gary had just come by to announce that there was a clod fight about to start at the field. So…I left the unfinished hole in my backyard and went off to the field for a clod fight with the fellows. “Uh, yes. I do.” (My own integrity condemned me here). “Want to tell me what in hades you were doing digging a hole in my back yard?” Dad’s voice betrayed a growing anger. Mom piped up. “You can do the dinner dishes first.” Dad thought that a fine idea and added that job to moving dirt. I was incredulous and announced at that very moment that I was running away, never to return. “ Not until you do the dishes and fill in that hole,” Dad announced. Two hours later found the dinner dishes done and the hole to China filled in. I went into the garage and grabbed an overnight bag to pack my important stuff in. I stomped out the back door and sat down on the porch to plan my departure. I had all my most important stuff (toys) packed and it was only left for me to decide where I wanted to move to. I decided that Borger would be as good a place as any. Sheesh. A man can’t even run away in peace. True story. Today’s essay concerns those young men among us who have yet to arrive at the stage of life referred to as puberty. If this terminal condition has yet to afflict you, young friend, please do read on. What follows is written for the sole purpose of guiding your path until, and beyond, that time of change and, I hope, preclude you from misery and strife. If you are a father of such a one, you are welcome to read and help your young man as he finds his way. Mothers and brides to be should not read this. What follows are a few, though not all-conclusive, general rules to be adhered to at all costs. Doing so will allow you to avoid no end of trouble from your peers and, in particular, your parents. Understand first that your bedroom is no place to hide anything that you do not wish your parents to know about. Things like cigarettes, items “procured” for amusement (i.e. toys, candy, and what not), and stuff you swiped from your sister in order to torment her. Magazines of a “feminine” nature are to be avoided at all costs. You and your parents know that possession is 9/10th of the law and any of these things in your room will find you guilty. Instead, hide all of this stuff either in the garage or the mini-barn, if you have one. With the exception of the toys, the presence of these things can be blamed on other members in the household (as long as they are older than you). If, in the above case, you throw any of the other members of your family under the bus as regards the contraband you are caught with, you must give consideration to possible retribution. The art of the bribe is useful here. You can give the stuff you stole from your sister back with the solemn promise that you will never lay hands on anything of hers again. That works with girls most of the time. With the guys in the house it is a little more difficult. Offer to give them access to your other stash of hidden goods as a peace offering. WARNING! Never offer those “magazines” to your father as it will, without doubt, result in a come to Jesus meeting. Never, EVER, for any reason, allow any snakes, horned toads, lizards, or other reptiles you have acquired to get loose in the kitchen. Take even more precaution against such an occurrence in the presence of women. To allow this to happen will avail you of the opportunity to witness and fall victim to a level of feminine violence that is not often witnessed by any male. Rare is the man who has retained his sanity after witnessing such an outburst. The better thing to do with your reptilian collection is let them loose before you enter your house. The best idea is to leave them in the field where you found them. They will be there tomorrow. One last word of wisdom. Never ever swipe candy from a store owned by, or which employees, a known combat veteran. They will kill you and no one will ever know. I was just stepping out of the front door for my morning walk when my cat, Toby, stopped me. “Shut up,” I said as I went to get the bird seed. I noticed several birds flew over to the feeder, only to find it empty. They hung about for a few seconds and flew to a nearby fence where several had gathered, most likely to complain about me. I got the feeder filled up and left on my two and a half mile walk. It was a little humid but was, nonetheless, a pleasant morning. I go through our neighborhood at a pretty quick pace and usually get lost in my thoughts. I did notice something a little different though. The birds were very noisy this morning. It also seemed as if they were following me. None of them dive bombed me (or worse, messed in my direction) but it was pretty clear the news of my unreliability as regards the bird feeder had spread throughout the bird community. I don’t speak bird but Toby does. I resolved to ask him when I got back home. The walk went on without incident though it was pretty clear that the birds were following me and announcing for the entire world to know that I was indeed the reprobate that left them without their morning sustenance. I wanted to ask whatever happened to wild birds fending for themselves but doubted I would get a straight answer. I made the inward observation that this is what happens when people and animals get too dependent on something without making do themselves. Ah, I digress. On my next to last corner, I came upon a retention pond. It is the biggest one in the neighborhood and is always populated with several ducks and geese. I was watching the morning crowd diving for breakfast when I happened to notice four geese. They were on the pond in a line and looking straight at me. When they had my devoted attention, they turned around, in unison, and dove their four heads into the water and their backsides straight up in the air. I had been mooned by four geese (this actually happened). The neighborhood birds had conspired against me. “Yes, they said they were going to get the geese to do that.” Toby was laughing so hard, he almost blinked. “What happened to wild animals fending for themselves?” I was incredulous. “You made them dependent, dummy, and now they don’t know how to find their own food.” Toby had made a point. I cannot print his response. Even a “expletive deleted” would not suffice. I was standing in line at the pharmacy the other day. Having much experience standing in lines from my days in the Army, I am adept at examining the little things that surround us in the routine of life. Such was the case this time as I waited on a lady who seemed to be purchasing enough medicine to combat the bubonic plague. Herewith are the conclusions of my observations. I never knew they had so much stuff to sell at a pharmacy. I won’t spend a lot of time cataloging all of the pills, ointments, and I don’t know what all they have to aid you and I in our quest for a life blessed by good health. I have observed there are three general categories that pharmacies offer for sale. There is the over the counter stuff meant to chase off those maladies that make life hard but won’t kill a body. Then there are the pharmaceuticals that are kept under lock and key behind the druggist’s counter. These are the drugs that keep folks alive, I suspect. I don’t know, having never been inside a druggist’s cage. Then there is the third category. I never knew about this category though, at many drug stores, this selection stares at you right in the face from every angle. I spotted this group of wares on a long shelf that ran the length of the pharmacist’s counter AND it was locked in a glass case. In order to purchase any of these products, I assumed one would have to have one of the pharmacists come out of their room (they are locked in I am told) with key in hand. What was in this case that required such security measures as this but not enough to be locked in the pharmacy cell? Enquiring minds (mine) want to know. There are times that I wish I was not so curious. An examination at one end of the cabinet revealed a variety of gauges and tools for use in managing various maladies such as diabetes and high blood pressure. I’m not sure why they felt the need to secure them under lock and key unless there is a hot market for pilfered blood pressure gauges and whatever it is they call the thing that does whatever it does with diabetes. I know the people that work at this particular establishment so am self-assured that they know what they are doing. At the other end were various pills and potions for reducing one’s weight or stopping smoking. This was a sizeable group and I cannot imagine why anybody would lock these things up. Surely, those who are desperate enough to purchase a pill or powder or whatever to lose weight or quit smoking ought to have unfettered access. Again, I trust the people that work there and did not question their logic. Then there was the stuff in the middle. It was the largest of the three product groups. How do I explain it? Hmmm…”Things.” That’s it. These “things” are designed so married folks can get along better. I do imagine, though, that it would be pretty embarrassing for a fellow to ask one of the pharmacists to bring out the key because he and his wife aren’t getting along so good right now and he needs help to get out of the dog house. Why lock these things up and force embarrassment on their customer’s I want to know?